Shikanoko, at what should be a warrior’s hour of greatest triumph, turns his back on those around him, in mourning for a secret love . . . The Spider Tribe, spurned by their guardian, explore the extent of their powers and ruthless ambitions . . .
Hina, who alone knows the whereabouts of the true emperor, has to forge a new identity of her own. No one must ever know that she is Kiyoyori’s daughter . . .
As the traditional powers navigate weakness and disarray, old spirits and new figures enter the epic battle for the Lotus Throne . . . 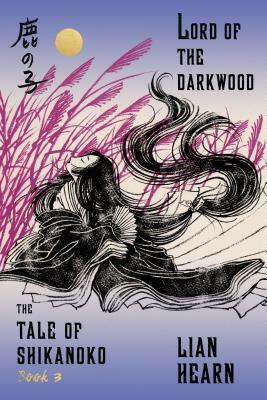 In Lord of the Darkwood, the major players of The Tale of Shikanoko are forced to deal with the consequences—expected and unexpected alike—of their past reckless actions. Each of them strives to achieve their destiny, but so far the paths they have followed seem to have done nothing but provoke Heaven’s displeasure. Profound betrayal, powerful magic, hidden identities, startling violence—these have made the weave of The Tale of Shikanoko so engrossing as it has played out across the sumptuously imagined, beautifully described world of Lian Hearn’s medieval Japan. But the story is now twisting towards its final resolution. Can peace ever come to the Eight Islands? Lian Hearn is the pseudonym of a writer--born in England, educated at Oxford, currently living in Australia--who has a lifelong interest in Japan, has lived there, and studies Japanese. She is the author of the bestselling series Tales of the Otori.